For a substantial period of time, the Town of Estes Park has been pursuing options to improve broadband access (high-speed internet) in the Town’s Light & Power (L&P) service area. With Federal and State grants, the Town completed a feasibility study, followed by a detailed engineering plan. The service area includes more than 300 square miles stretching from Glen Haven through Estes Park, Pole Hill, and down Highway 7 to Allenspark. The estimated cost to install the system is near $30 million. The Town reached out to private and commercial firms to assess interest in building the system, but the return on investment for private firms was too low -- none saw the entire project as financially enticing. Therefore, the Town employed a consultant to complete financial projections for a Town-owned broadband utility providing a minimum of 1 Gig service to everyone who subscribed. The projections showed a reasonable financial path in which utility revenue bonds could be paid off in 12-18 years. The Town Board asked staff to determine the Town's ability to acquire revenue bonds to construct the utility. In the spring of 2018, the Town employed a bond advising firm. Town staff are now working with the advisor to prepare the materials necessary for bond underwriters. Later in 2018 staff will be able to report to the Town Board if it is feasible to obtain funding to build the broadband utility. If funding is available and if there is positive agreement of the Town Board to move forward, the Town would then solicit bids for installation contractors and materials acquisition. Construction could begin in 2019. As it relates to Highway 7 from Estes Park to Allenspark, the Town’s Light and Power Division installed fiber to Allenspark, primarily for “Smart Grid” purposes. This $1 million project will enable monitoring and proactive maintenance of the electrical grid in that area. It was also designed to have the capacity to support broadband to residents and businesses along Highway 7 into Allenspark. Comparing Fiber-Optic Technology to Planned Satellite based Gigabit Internet (SpaceX and OneWeb). Some Thoughts about future broadband deployment in Estes Park. In the below report, NEO Fiber provided detailed engineering and financial analysis of broadband service options for the area served by Estes Park Power and Light Division. The analysis is based on extensive, real-world experience and industry-standard assumptions. Private-Public Partnership opportunities for local internet service providers. NEO Fiber examined, in detail, five different models of service delivery. After extensive evaluation, the only two financially viable models were 1) Retail Services to Businesses Alone or 2) Retail Services to Businesses and Homes. These two models were financially viable because they provided sufficient income from user fees to retire infrastructure buildout debt. The other three models, 3) Infrastructure Owner Only, 4) Government Services Provider, and 5) Open Access Provider, did not produce sufficient income to retire infrastructure buildout costs. There is strong public support for access to competitive broadband as demonstrated in the February 2015 SB-152 special election results, and as found in the NEO Fiber broadband survey in which 93% said they would be interested in accessing a faster, more reliable broadband network. 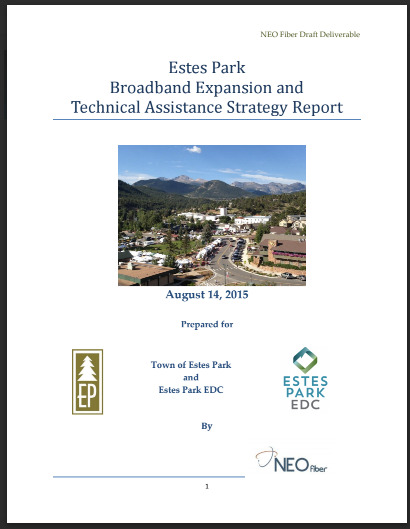 Competitive broadband is essential to sustaining and developing Estes Park’s economic and cultural vitality. NEO Fiber Draft Deliverable determination that broadband internet access is a utility, as necessary to contemporary life as electricity, roads, and water systems. In NEO Fiber’s broadband survey and public engagement discussions, it was clear that Estes Park’s current levels of broadband service are considerably more expensive and slower than what is currently available in our competitors’ areas within Colorado, nationally, and globally. If providing competitive broadband services to Estes Park were financially attractive to the private sector, it could be argued that it would have already happened. High initial capital costs, higher than public sector borrowing costs, need for higher return on investment than in the public sector, and our comparatively small customer base and consequent small revenue stream, make private sector provision of speed and cost competitive broadband service unlikely. In the course of its evaluation of broadband delivery options, NEO Fiber met with all of the local service providers. Along with the general private sector issues identified above, restricted access to capital and return on investment concerns may limit local internet service provider ability to furnish more competitive broadband services. Sign up to receive Estes Park EDC news and updates.